“Beelzebub’s Tales to His Grandson” or “An Objectively Impartial Criticism of the Life of Man” by Gurdjieff is the first series of works in the larger trilogy. “All and Everything”. Now we got them all here at Holybooks.com which is good since Gurdjieff underlined the importance of reading the books in the correct order. Beelzebub’s Tales is included in Martin Seymour-Smith‘s 100 Most Influential Books Ever Written, with the comment that it is “…the most convincing fusion of Eastern and Western thought has yet been seen. I encounter Gurdjieff frequently in books, libraries, and literature. I have read and read and read All and Everything and found it defective. 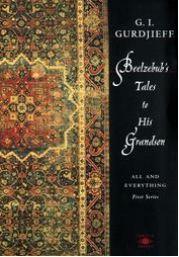 I am quite sure that the edition I got on inter-library loan of Beelzebub’s Tales To His Grandson was abridged.